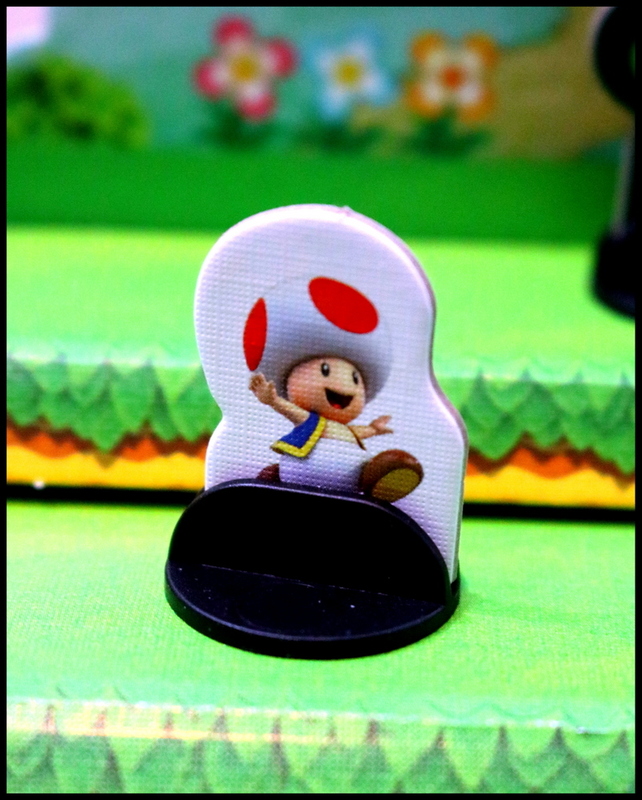 Quick Look: Super Mario Level Up! 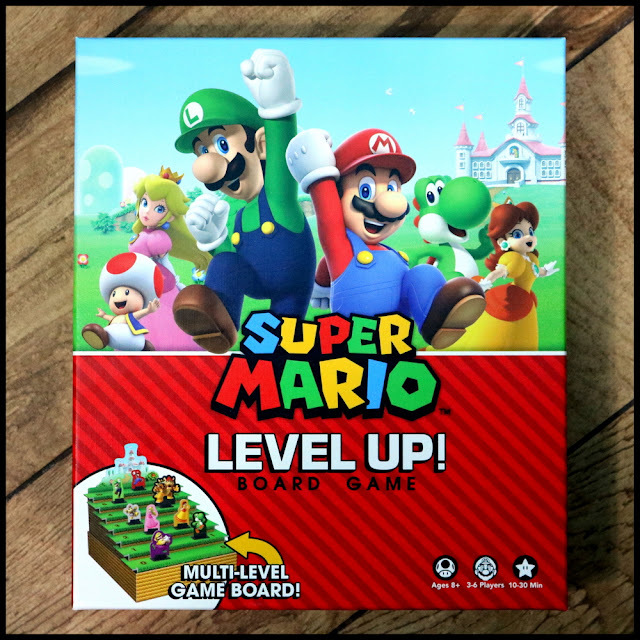 In Super Mario Level Up!, join Mario and his pals as you advance them up the Mushroom Kingdom while challenging other players to gather the most coins and reach the castle at the top. Each player starts with a unique line-up of characters that they are trying to score the most points with. Players take turns moving any character up the board until a character gets to the top. Once a character has advanced to the top board, players vote to see if the character stays or is kicked off the Mushroom Kingdom. It takes only one NO vote to get them off the board, and players should use their NO votes wisely, as each player only has two NO votes in their hand. The round ends when the character is unanimously voted to stay at the top. Score up your points and play another round. Game ends after three rounds. 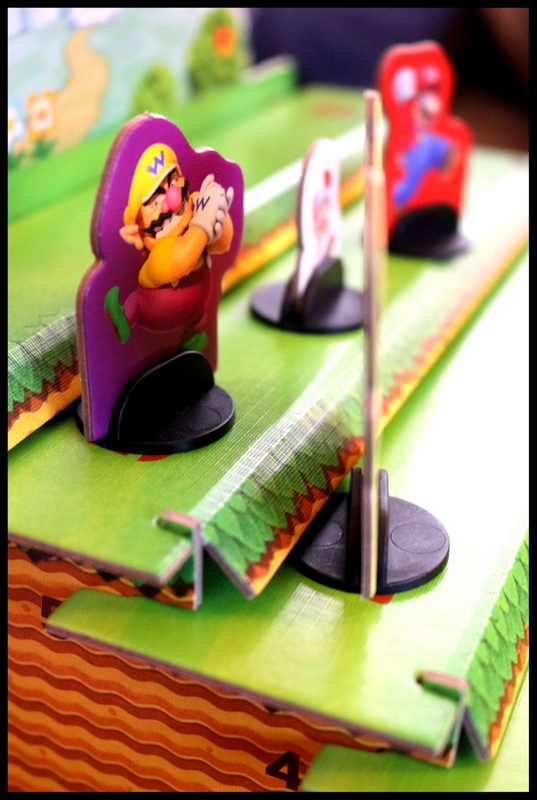 This game reimplements King Me!, designed by Stefano Luperto. If reading that made you grin and hear Mario's little voice in your head, then this is probably the game for you. 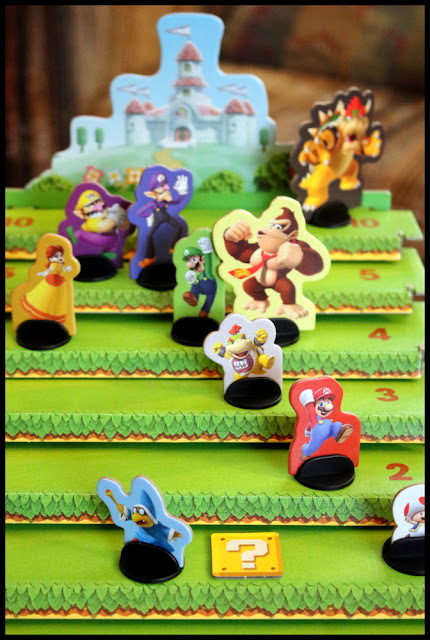 Thirteen cardboard standee characters from the Mario universe make their way up and down a 3-D game board, competing to reach blocks first to gain 1-Ups, knock others down with turtle shells, gain Power Up cards, and more. Super Mario Level Up! is dripping with Mario. The Super Mario Level Up! rule book is very well laid-out, with cute introductions from the characters and a special section for "Set Up" followed by a clearly marked section for "How to Play." 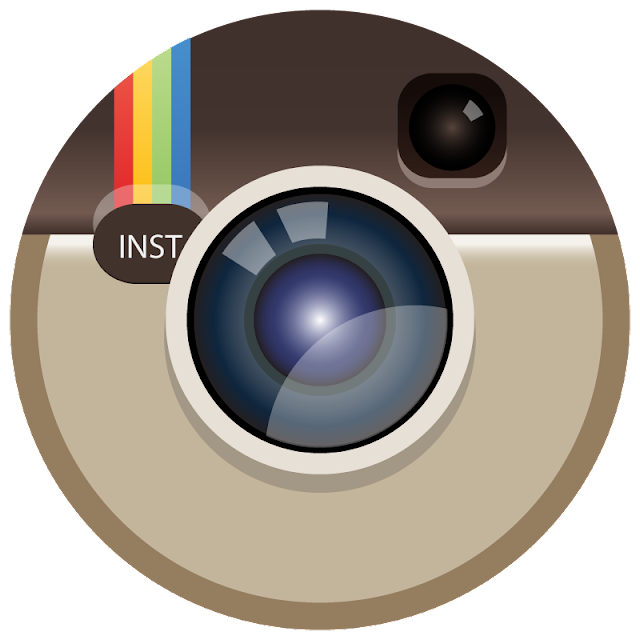 The rules are easy to follow, with helpful illustrations on every page, clearly titled charts, a large font, and several key words in bold or marked with different colors. The actual 3-D board is really cool - that's what all the kids said when they saw it the first time, with a hushed awe in their voices - but it is very fiddly to set up and really needs to be handled by an adult. 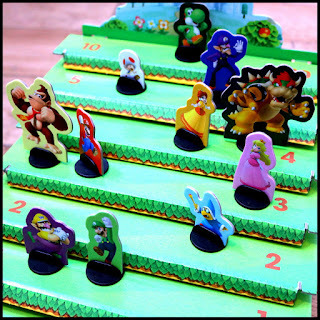 The places where the cardboard joins fit snugly but are prone to splitting the cardboard ends if you're not absolutely precise in your movements, and the lips that kick down to make the front of the steps don't actually stay at a 90-degree angle, making it common for little hands to catch a player piece under one of the lips and flip it up or bump a whole section of the game board. I found myself trying to think of a place where I could keep the game board pre-assembled and superglued together to avoid those problems, but that kind of space is hard to come by in a room already overflowing with games. 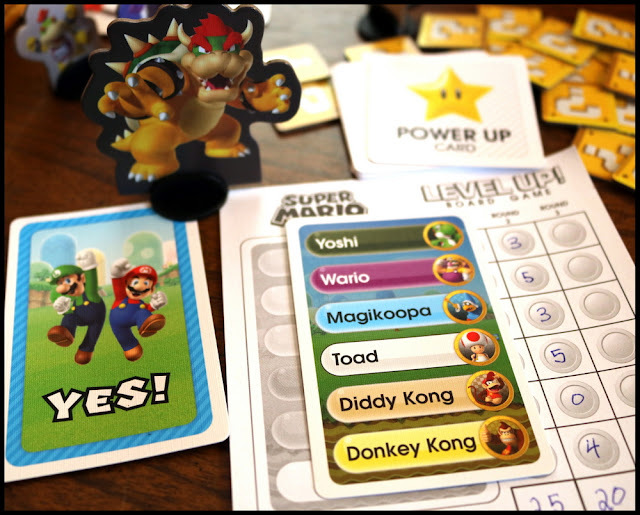 The rest of setup is a simple matter of shuffling and dealing cards and tiles and having a score sheet for everyone (pens or pencils not included - this is a good use for those Mario-themed pencils from your last birthday party goody bag!). 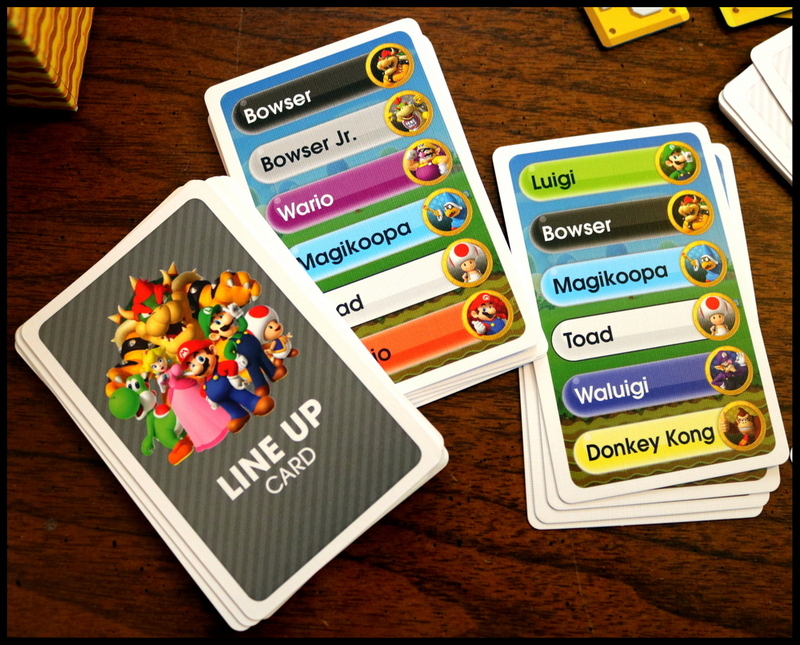 To begin Super Mario Level Up!, each player is dealt a LINE UP card, which gives a list of six out of the thirteen possible characters who can score for you. Players take turns adding the characters one at a time to Levels 1-4 of the game board, trying to position the characters on their LINE UP card well - without being too obvious about it. Extra characters get added to Level 0, and no characters go onto Level 5 or the level just above it, Level 10. 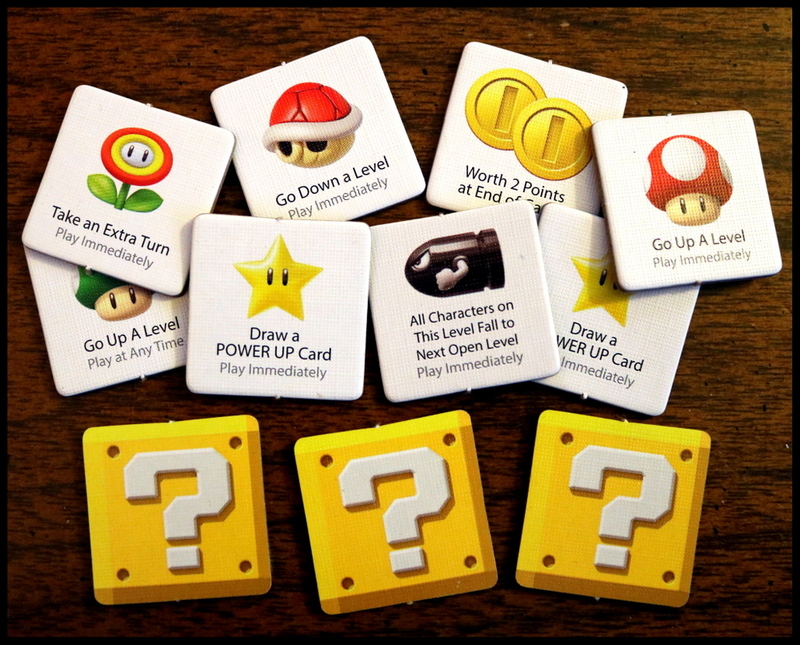 Once the characters are on the game board, with no more than four characters per level, [?] Blocks are placed on each spot on Levels 1-5 that does not have a character. Players take turns moving one character up the board one level, trying all the time to bluff their way into advancing the characters on their card. If a character moves up onto a level that has a [?] Block on it, the player draws that block and takes the action - moving characters up or down, drawing a POWER UP card for later use, scoring end game points, etc. POWER UP cards give even better advantages and can be saved until you need them. When one Super Mario Level Up! character is moved to the top, Level 10, it is time to vote. Each player has one YES card and a certain number of NO cards (based on the number of people playing). Do you want the character now on Level 10 to be the Champion, and to score now? If so, play YES. If not, play a NO card. If even one NO card is played, the character is removed from the board. Players get their YES cards back but forfeit the NO cards played - meaning at some point in the round, you may only have your YES card left and must vote YES to any further votes, so vote strategically! You may even choose to put a character you don't want as Champion up to Level 10 just to play a NO card and get that character out of the game. Once a Champion gets all YES votes, it is time to score. Each character on your LINE UP card scores a number of points equal to the level they ended on. Total up your score for the round; then, play two more rounds to finish the game. There's also an option - making strategy a little more interesting for older players - that is basically "Shoot the Moon": if you take zero points for your characters in the third round, you get a perfect score of 33 instead. So far, no one has gone for that, but we've been tempted. The artwork is solid, colorful, and above all, classic cartoony Mario and his friends. 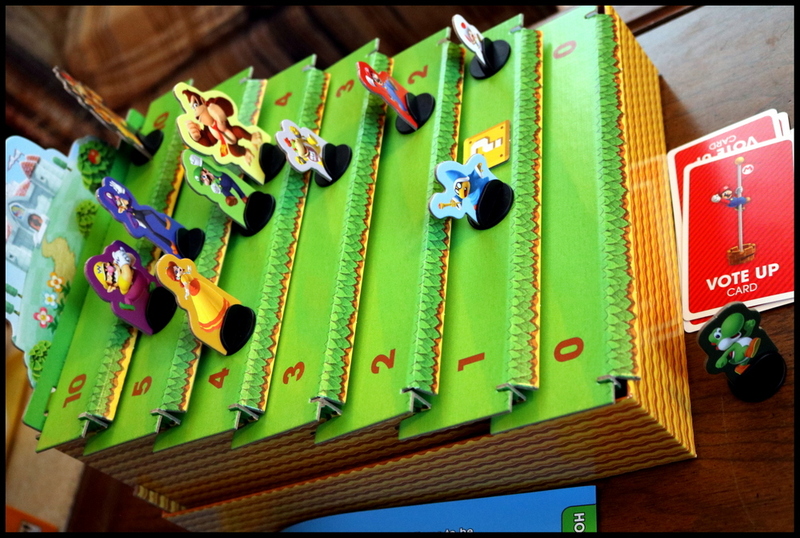 Bright colors and familiar faces draw the kids to the game, as does the eye-catching 3-D game board. 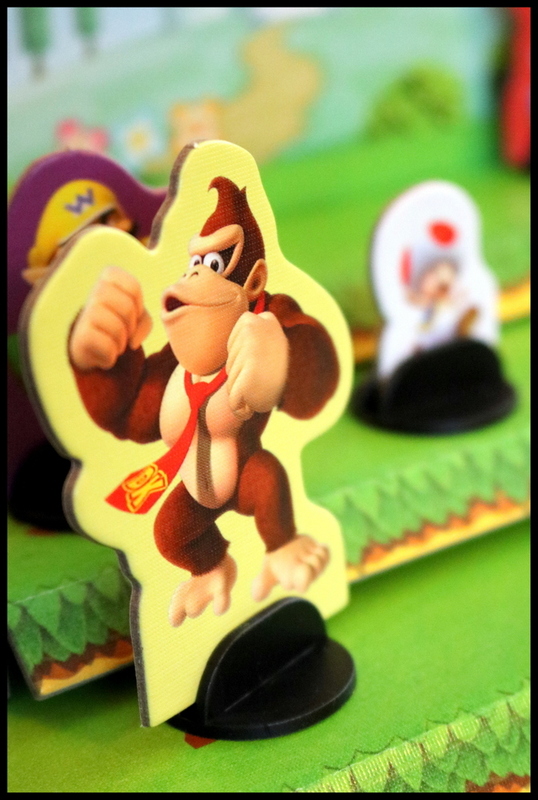 The characters are made of thick cardboard, with the image on one side and the name on the other (which is helpful in case anyone playing the game isn't familiar with all the characters; however, the font is a little small). They fit snugly into their plastic bases. The cards and tiles are good, standard quality. As I mentioned earlier, I am concerned that the 3-D game board is difficult for kids to set up and will not hold up to repeated assembly. In addition, real fans of the game will rip through the score pad quickly, and may want to make copies, laminate a set, or just wind up using scratch paper to keep score. 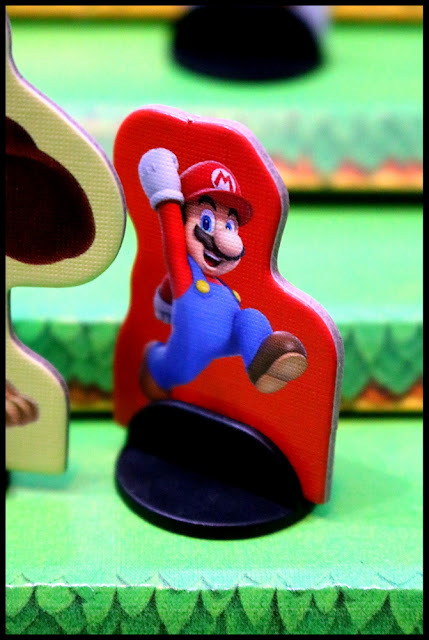 The 3-D game board for Super Mario Level Up! is a huge wow factor and draws kids over to find out how to play. The rules are laid out well and easy to learn. The social bluffing and positional strategy aspects are fun, and the quick votes hold a good amount of fast-paced tension. The [?] 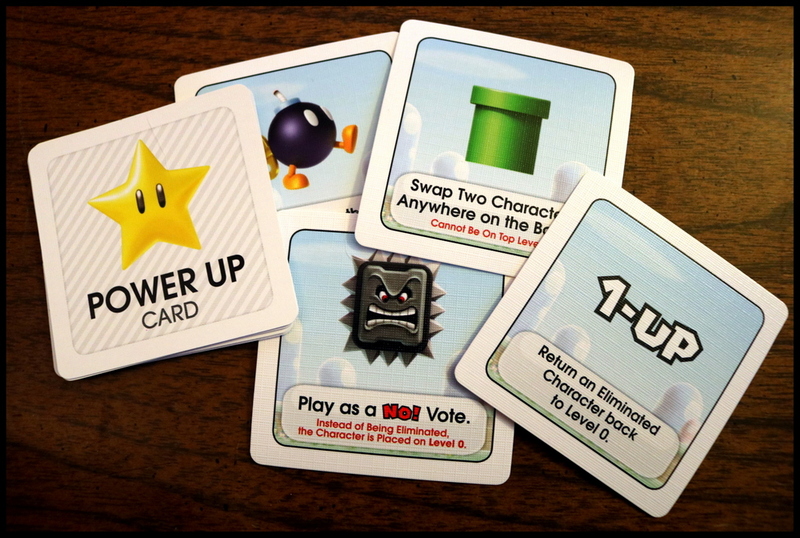 Blocks and POWER UP cards give some variable bonus powers that can change game play from one round to the next. Once the board is set up, this is a nice social filler game. Unfortunately, the biggest wow factor for Super Mario Level Up! - its game board - is also its biggest detriment. 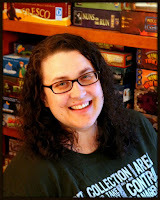 Young kids are likely not going to be able to successfully assemble the board without smushing or tearing any of the cardboard joins, so it takes a calm adult hand to prep the game. Having put it together for just a handful of games, I'm also already seeing that the cardboard joins won't hold up to repeated play, even when assembled by adults, and that is enough of a problem that it drops my rating for what would otherwise be a decent filler game. This might be a good fit for Mario fans who have the shelf space to leave the board assembled somewhere and don't need to weaken it by putting it together and taking it apart repeatedly. I'd also suggest laminating a set of score sheets before you go through the whole pad. The fun of the characters and themed cards makes Super Mario Level Up! a draw for the younger gamers. 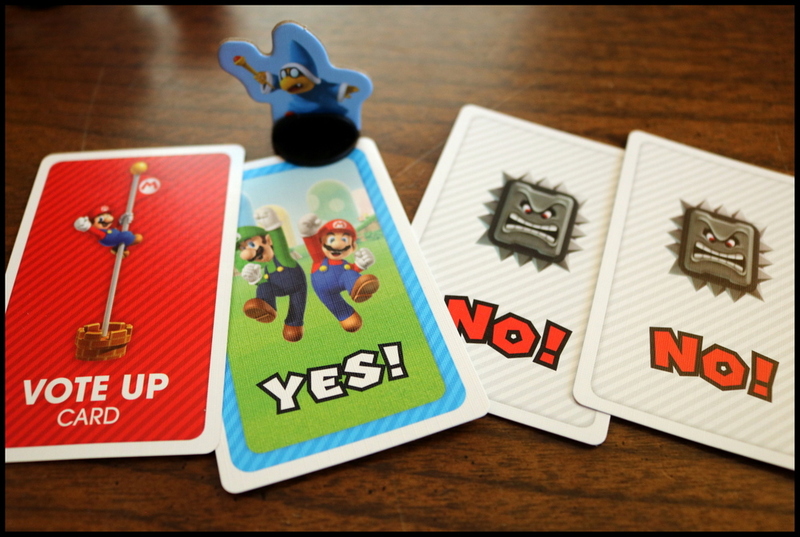 The positional bluffing, quick voting, and special abilities make this a solid and slightly thinky filler game for older Mario fans. Unfortunately, the fiddliness of setting up the board and the inability of the cardboard to hold up over time drops the game's overall rating for me from a 6 to a 4. Super Mario Level Up! will be a hit for players who have already enjoyed King Me! or one of its variants or similar bluffing/positional games like Tiki Topple or 13 Dead End Drive; it is also a good choice for fans of the Mario universe and its many games and characters. I am giving Super Mario Level Up! 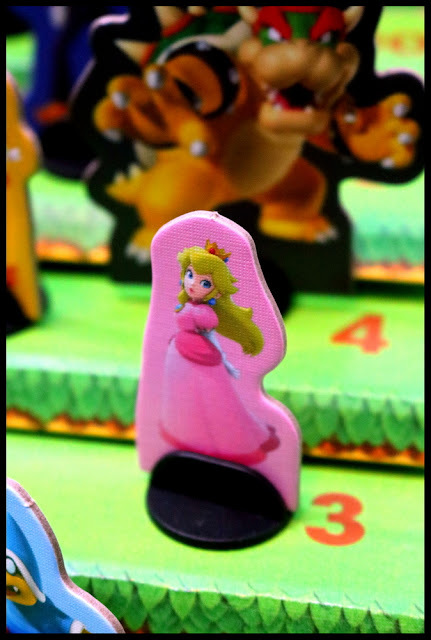 4 out of 10 super meeples.